Returning to the discussion on domestication in Southern Egypt and the Nile, rock art pictures in western Jebel Uweinat at Karkur Ibrahim (see map at right) show the final stage in the domestication of cattle. Calves are secured at a hitching post, while their cow mothers and humans look on. I can imagine the prolonged bellowing "moos" of the mothers calling to their calves. 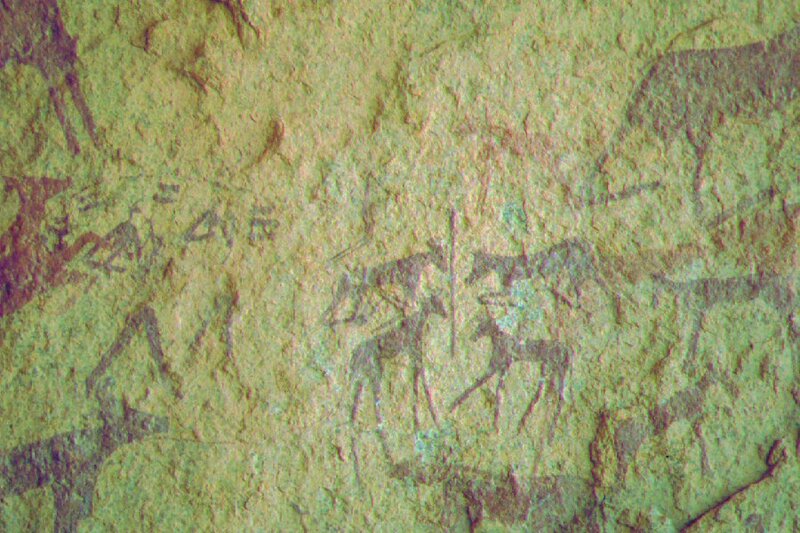 These Late Bovidian pictures at Jebel Uweinat show many humans, including large groups of humans, as well as herds of cattle. This place must have once been bustling. Yet, we know that the cessation of the rains at the end of the great Wet Phase gradually returned Jebel Uweinat to the desert. There is still a spring at Karkur Murr and the area is on the way point of an arduous journey between Northern Egypt and the country of Chad. But evidence would indicate that with the cessation of rain, the cattle and herder civilization that once filled Jebel Uweinat headed south into the Sudan, and eastward to the Nile Valley. There's also some evidence that some made an exit south and west along the Sahel corridor. That evidence I plan to discuss in the next posts.